MET ÉIREANN HAS issued a drought warning for the country as Ireland’s prolonged heatwave is set to continue into next week. The weather service issued the warning this morning at 11. It kicked in at 11.07 and is due to last until next Friday. It said that “drought or near-drought conditions will persist through the coming week”. A drought occurs in a period of abnormally low rainfall, which leads to a shortage of water. The warning is coupled with a status yellow high temperature warning for the country which has been valid over the last week. It comes as temperatures today remain in the high 20s, with no break in the warm weather expected. Met Éireann said that there may be some isolated showers tomorrow, but that overall there will be no break in drought conditions. The heat has forced Irish Water to put a hosepipe ban in place in the Greater Dublin Area from Monday. 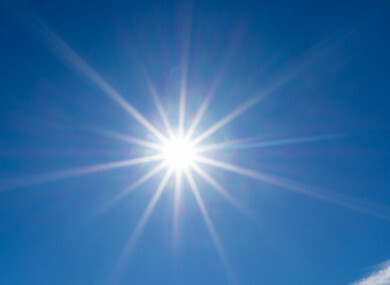 The HSE’s advice is for people to stay out of the sun between 11am and 3pm and to apply sunscreen if you have to go out in the sun, and avoid extreme physical exertion like sport, DIY or gardening when the sun is at its hottest. Meanwhile, the public has been asked to report any sightings of distressed fish which may be caused by high water temperatures and low water levels. Email “Met Eireann issues drought warning for entire country as heatwave continues”. Feedback on “Met Eireann issues drought warning for entire country as heatwave continues”.